Tue., Aug. 11, 2015, 8:12 a.m.
• Thursday Vernon Adams discovers if he’s going to become an Oregon Duck. Or if the former Eastern Washington quarterback is going to ... well, that’s the million dollar question isn’t it? Thursday Adams, who announced in the spring he would graduate from EWU and take his talents – as a fifth-year senior – to Eugene. He’s in Eugene right now. But he hasn’t graduated from Eastern. Seems he’s on his third, and final, time trying to pass his last math class needed for his diploma. According to Sports Illustrated, Adams will take an hour-long on-line test Thursday, starting at 12:30 p.m. He’ll wait about an hour to see if he passed and, if he does, head over to the football practice facility and join his new teammates. But there is no guarantee he will pass. I’ve been told this is Adams’ third attempt to finish this one upper-level class. If he doesn’t pass Thursday, he can still graduate. Someday. But, by his own admission, not in time to join the Ducks for this season. So what happens if Vernon fails? Then everyone loses. Adams’ loss is obvious. He took a gamble earlier this year. Bet on himself. He doubled-down on his college football experience, opting out of his last year with Eastern, where he was one of the top two or three players at the FCS level, and put all his chips on playing for Oregon, recently one of the top two or three FBS programs in the nation. He cut his ties with Eastern, leaving the Eagle coaching staff fuming and EWU fans ticked. There is no turning back (or is there, but hold that thought for a second). Oregon also loses because of the circus Adams’ possible arrival has caused. His transfer attempt has brought the fifth-year, graduate rule – a person with a degree and eligibility left can transfer and play right away as long as he or she pursues a graduate degree at the new school that is unavailable at the old one – back into the spotlight. It also dragged the Ducks’ program there. Oregon already would have been dealing with the loss of Heisman Trophy-winning quarterback Marcus Mariota no matter what. Who would replace him would be the hot question. Throwing Adams’ botched transfer attempt – whether he passes Thursday or not, this whole episode has been unsettling – on top of that has created a dumpster fire. Sure, the Ducks are getting scorched by their own flames, so it's hard to feel sorry for them. They wanted Adams, whose upside is tremendous – as illustrated by his performances against Oregon State and Washington the last two seasons as well as his entire career at Eastern. But the Oregon hierarchy had to know Adams’ graduation was no sure thing. And the way the long goodbye from Cheney has played out as smoked the Ducks’ reputation further. As if that were possible. Yet there could possibly be another loser in this. Eastern Washington coach Beau Baldwin has already had to deal with the loss of the FCS’ best quarterback, a guy capable of carrying the Eagles to another national title. Now he may face another public relations nightmare. There are a couple of sentences in the SI story that illustrates that point: “If he doesn’t pass and can’t join the Ducks, Adams isn’t sure what he’ll do. Returning to Eastern is possible, but it's unlikely the Eagles would take him back.” Unlikely? How about no chance? However, that could turn out to be embarrassing to the school. How? Simple. Let's say Adams fails the test Thursday afternoon. He’s got nowhere to go. He tells every media outlet in the world – and just about all of them would listen; everyone loves a good tragedy – he knows he made a huge mistake. He should never have reached for the brass ring. Or maybe he says he was led astray by the Ducks. Whatever. He wants to come home, to Cheney, to Eastern where he knows he always belonged. He hopes Baldwin and the Eagles will find it within their hearts to forgive him. Then what? What does Baldwin do? It’s a decision fraught with danger. Take him back and the team could splinter. Say no and the team may splinter anyway. Plus Baldwin looks heartless. Like I said, a losing proposition. But heck, it might all be made moot Thursday. Maybe the third time is a charm for Adams. He passes the test, runs over to the Oregon football facility, is actually let through the locked doors by the guards and wows everyone with his powerful right arm and lightning quick feet. He wins the starting quarterback spot, leads the Ducks to the national title and earns the Heisman. And everyone wins. Well, everyone south of the Washington/Oregon border. ... As for the corrections, in my defense, uh wait, there isn't one. I screwed up the day. But that doesn't take away from how important Thursday is to Vernon Adams. Let's hope he passes. It would be the best thing for him. • Personal note time. It is Aug. 11. A key date for Vince Grippi. It is Kim’s 36th wedding anniversary. (Technically, it’s mine too, but I was so scared that day – and hot and sweaty and hungover; thanks everyone for the night-before bachelor party, now that was a bad idea – I don’t really remember much. I just take her word for it we were married legally and all that jazz.) Every year on Aug. 11 I take a few minutes to realize I actually can make the right decision once in a while. I made one in 1979. Thanks to that decision, all the stupid ones I’ve made since are water under the bridge. Picking the right person to spend my life with – and her actually agreeing to the deal –made all the difference. Man, am I thankful. Want to know how long we’ve been married? So long, the engraving of the wedding date on the inside of my ring – put there so each year I can get the date right no matter how bad my memory gets – has almost worn away. It takes a magnifying glass and fingerprint dust to bring it to light nowadays. Which means one of these years I won’t be able to read it and I’m going to get the date wrong. Ooh, that won’t be good. • WSU: It’s going to get hot in Lewiston the next couple days. Poor Jacob Thorpe, standing out in that heat. I feel for him. No matter what, though, I’m sure he’ll continue to overflow the blog with player interviews. He did it again today, with videos of Colton Teglovic, Parker Henry, Darius Lemora and coach Mike Leach. He also has a story in today’s paper about the development of the nickel back position, a blog summary of yesterday’s practice and another blog post this morning with links. ... California's basketball program is on the rise. ... As part of his 100th anniversary series on the Pac-8/10/12, Jon Wilner ranks the league’s coaches. I can’t argue with his No. 1. 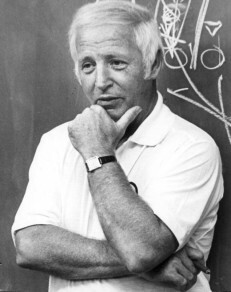 John McKay (pictured) was the best in so many ways. The Washington State connection? Dennis Erickson was No. 6 on Wilner’s list. • Gonzaga: I usually don’t link pay items, but when ESPN ranks two Zags among the top 20 returning players in the nation, it has to be mentioned. Kyle Wiljter is No. 3 on this list and Domantas Sabonis is 20th. • EWU: The Eagles, without Adams, are still ranked sixth in the nation by this poll. ... Southern Utah has a new athletic director who hopes to improve their athletic fortunes. • Shock: Most days this would have been my column topic. And it may still be tomorrow. The AFL is having financial troubles. Again. The league had to take over two franchises and then closed them down as soon as the season ended. This unstable atmosphere is troubling to Shock owner Nader Naini, who talked with Jim Meehan yesterday. The Shock, who still draw well and seem to be one of the league’s more viable franchises, are examining their options. Jim’s story is not to be missed. • Indians: A 9-5 win over Tri-City is nothing to laugh off. So Spokane manager Tim Hulett didn’t, acknowledging it was a big victory for his club. Tom Clouse has all the particulars in this game story. • Seahawks: The Hawks were back at practice yesterday and will play a preseason game Friday against Denver. Forget about the exhibition for the moment. Concentrate on the offensive line. It seems to be in flux again, despite Alvin Bailey and Russell Okung’s best efforts to earn a spot. ... There are a lot of guys to talk about, of course, including a seemingly invincible Bruce Irvin, former UW star receiver Kasen Williams and Dion Bailey. • Mariners: The Adam Jones trade just keeps on giving, doesn’t it? Jones homered again yesterday, leading the Orioles to a 3-2 win over the M’s at Safeco. ... Taijuan Walker gets the start tonight and it may be one of his final ones of the season. The M’s are looking to shut him down, along with rookie Mike Montgomery. No reason to risk injury in a season that is basically over.